I want to say a big thank you to everybody that helped in the Trade Unionist and Socialist Coalition (TUSC) campaign in the Uplands by-election. Thanks especially to all the people who aren't, members of my own party, the Socialist Party. 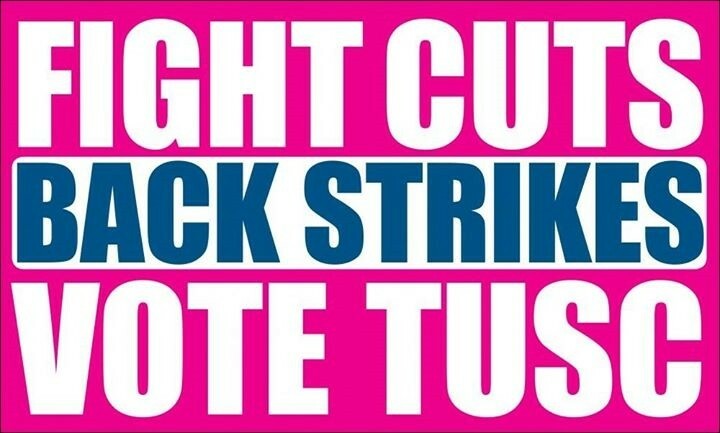 TUSC is a coalition and we're beginning to build it as such in Swansea. Towards the end of our campaign the Left Unity group agreed, at their national conference, to work with TUSC in local campaigns; another step towards achieving our target of contesting 100 parliamentary seats and 1,000 councillors positions in May. As we'd expected, in Uplands Labour was punished for the Labour Council's continued programme of cuts and outsourcing in Swansea and for the outgoing Labour councillor's failure to attend meetings to represent constituents. Peter May, the former Liberal Democrat, topped the poll as an independent. May won with 600+ votes, an incredibly small winning vote for Uplands, which shows how low the turnout was in this by-election; well under 20% (I'll update details when I've had a chance to check the maths). The low turn out was inevitable given the lack of coverage given in the local press. We weren't able to overcome that given our limited opportunities for daylight canvassing. As you'd expect with a trade unionist coalition, most of our members are working and we didn't think it fair to knock people's doors after dark. Of course we're a little disappointed with our final vote, 31. Nevertheless I think we've achieved a lot in this short campaign. The whole ward was leafleted at least once, some parts twice; hundreds of students making their way to the Uplands were also leafleted. We had 3 really enjoyable Saturday campaign stalls in Uplands Square. This was my personal highlight of the campaign as it was the best opportunity to meet and discuss with people. There are hundreds, maybe thousands of people in the Uplands who hadn't heard of TUSC before who now know who we are and something about what we stand for. That will be a good starting point and preparatory work already done for the general election in May. Swansea West is one of the seats where we're already preparing to stand as part of the biggest ever electoral challenge from the left of Labour. People in Swansea will see much more of our eye-catching banner in the months and years to come. If you're fed up of Labour carrying through Con-Dem cuts but we couldn't persuade you to vote for us this time round then we will be having another go at persuading you come May. 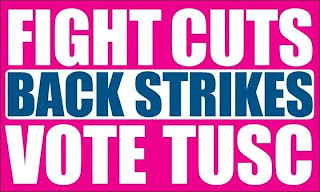 I'll be taking a short break for writing for this blog for a little while but all the constituent parts of TUSC and its supporters will be continuing to organise against cuts and putting the case for socialism in our workplaces and communities. If anyone wants to know more about my own party, the Socialist Party, in Swansea, our website is http://www.swanseasocialistparty.org.uk/ and you can find our members at the Castle Square end of Oxford Street every Saturday. TUSC has advanced a long way from its founding 4 years ago. It's not always reflected in votes but we'll reviewing our campaign in Uplands to see how can we reach and talk to more of you in May. For smaller branches, such as ours, an inspirational campaign! Thanks that's very nice of you Bernard. It has been an enjoyable few weeks. What's socialism got to do with it? No to cuts to school playing fields!